Possibly useful accounts of minor technical achievements. The following post explains how you can turn a Raspberry Pi (RPI) into a wireless router that connects to the Internet over a VPN. By plugging this into your existing wireless router, you give yourself a second wireless network, and any devices connected to this network will access the Internet over the VPN. Sharing a single VPN connection between several devices. Using the VPN connection with devices that don't support VPN or proxy settings. As an added bonus, the use of NAT and a couple of firewall rules provides a good level of security for any connected device. I've found this setup works very nicely, and is fine even for streaming media. A Rasberry Pi with Raspbian installed. A wireless USB adapter with a chipset that supports Access Point or Master mode. I used a Panda PAU03, and it worked perfectly and has a good signal. See the RPI Wireless Hotspot article for other options. A wired Ethernet connection between the RPI and your router. A VPN service you can connect to that supports tunneled connections and OpenVPN. It's entirely possible you could get this to work with a tap VPN connection, but I can only vouch for the tunneled variety. OpenVPN support is a must: watch out as not all providers support it. The following instructions assume a basic knowledge of Linux, the command prompt, and the ability to edit files with an editor such as Vi or Nano. I've reconstructed these from my command-line history and the above articles, but haven't done a clean run-through, but I think they should work. Please let me know if you find any mistakes. Your going to be connecting your RPI to the rest of the Internet via a VPN, which means it won't enjoy the protection of your router's firewall: the VPN tunnel will punch right through and expose your RPI to any machine on the Internet. We'll lock down the VPN connection later on, but before you start, make sure you've changed the default user password using the passwd command. Before you start, your RPI will need to be connected to your router via the Ethernet port and able to access the Internet, and your wirless USB adapter will need to be plugged-in. You should see a network interface listed called tun0, assuming your VPN provider uses a tunnel (rather than a tap) interface. sudo sh -c "iptables-save > /etc/iptables.nat.vpn.secure"
Now we have a VPN, we can set up our wireless network and access point. You should see an interface listed called wlan0. This will give your new wireless network the IP range 192.168.0.1 - 192.168.0.254, and assign the address 192.168.0.1 to the wireless connection of your RPI. You might need to change the IP addresses if they clash with your existing network (check using ifconfig and looking for the IP address of the eth0 interface). The above configuration also tells any connected devices to use the RPI for their DNS server: we'll get to that later. Note those are tabs in front of the indented lines. Change YOUR_SSID and YOUR_PASSWORD to be network name and password respectively for your new wireless network. It's also worth checking the channel your existing router is using and making sure this one doesn't clash. Now we'll set up a local caching DNS server on the RPI which will be used by the connected devices. The above IP addresses will use Googles public DNS server, but obviously you can choose an alternative if you prefer. Just don't try to use the DNS of your existing router, which won't be accessible over the VPN. Finally, we just need to set up NAT for the VPN connection, which will allow us to share the connection with any connected devices. With any luck you should see the same details you saw when you accessed the service over the VPN on the command line. To make absolutely sure things have gone well, try changing back to your other wireless network and refreshing the page: you should see the details change. In your hostapd.conf you specify a driver for the wifi single. In others pi wifi router projects a different one is used eg driver=rt1871xdrv. When I did one of the projects the driver line caused it to fail but commenting out the driver line led to success and I'm not sure I understand why. My question is how can I identify what to put in the driver line? Hi, sorry for the very slow response. Essentially this comes down to the wireless adapter you're using. Different adapters have different chipsets that support different drivers. The driver I use (nl80211), is the user-space counterpart to cfg80211, which some adapters support. My openvpn provider gives me some .crt and .key files along with a sample config. Where do i put the files? just in the same place as the openvpn.conf file? Can you please advise a VPN provider that supports this setup? I've tried multiple providers, including PrivateInternetAccess and StrongVPN and none support it. Seems like an excellent guide but can't even start OpenVPN as don't have a config containing my username and password - both of these providers refused to help. Never mind, managed to get it working saving a login.conf file containing my username and password for PIA. Now just waiting for my new USB adapter and hopefully it will be up and running. Just out of curiosity, I currently am able to SSH, WOL, Sabnzbd and torrents remotely via the internet for my NAS. Where will I add the port forwarding rules on the Pi? Is it part of the ip tables? If the lines appear as above with no path in front of the certificate filenames, then OpenVPN will look for the certificate files in the same directory as the config file. Yatsehitter: Glad you had some success. Just FYI, StrongVPN do support OpenVPN: take a look at this page: http://www.strongvpn.com/compare.shtml. Good question regarding port forwarding. If you're looking to run services like bittorrent over your VPN then you will need to add iptables rules to allow this, as the rules I listed will block all incoming connections. It's not something I've tried myself, but the following post looks provising: http://www.cyberciti.biz/tips/linux-iptables-open-bittorrent-tcp-ports-6881-to-6889.html. on to my problem as i said it worked but only once. im stuck on obtaining ip address and authenticating. where did i go wrong? everything else seems to work. the PIA connection at boot along with the services booting up. the pi browser also works fine and routes all data threw PIA. sanju83: When you say it worked once, do you mean you could connect a device to the new wireless network and connect to the Internet over the VPN? If so, did you reboot the Pi after it was working? At any rate, this sounds like a problem with the configuration for the wireless access point. Check the steps in the section "Configure Wireless Network and Access Point", and make sure you've covered all of them. It might also be worth trying to connect to the Pi's wireless network with several devices to see if you get the same problem. Its me again. See first comment. I have eventually found the driver for my WiFi dongle. It turns out it is already built into Raspbarian (rt2870) and so I don't need to specify it apparently! But if you have a moment can I ask, were it to be one not included in the distribution, such as your rt1871xdrv, where would one put it in the file system so that the line 'driver=rt1871xdrv' in hostapd.conf would find it? Please substitute nl80211 for rl1871xdrv in my last comment. I wasnt thinking. Could you give me a hint to understand what is happening? The first thing I'd do is go over the instructions in the Configure Wireless Network and Access Point section and check that your settings match. I actually just spotted an error in the text: the line in /etc/default/udhcpd should read DHCPD_ENABLED="yes". I've updated the text in the post. Does the IP address your laptop got assigned fall within the range you entered in /etc/udhcpd.conf? It should be between range set by the start and end lines in the file. If it doesn't then you're not connected to your Pi's wireless network. If it does then you're fine; the fact that it's a local IP range is fine as the Pi will perform network address translation to the VPN's IP address. Have you got any other tip of what I am doing wrong? I had the same problem. In my case udhcpd wanted to write in a file called "udhcpd.leases" which did not exist. I forget the path, however you can check the log file of your rasbian os. I created the file and everything just works fine. I hope this helps. Apologies to Gavin Robertson: I was clearing out some spam comments and accidentally deleted your very helpful comment pointing out the typo. It's now fixed, thanks for the feedback and glad it all worked for you. Montse - apologies for the slow response. Hopefully Alexander's comment is helpful to you. James - the first things to check here would be that NAT is definitely enabled for iptables, and that the NAT rule is present and correct in your iptables config. This should return 1, not 0. If you get different results for either of these, go through the "Set Up NAT for the VPN Connection" section again and make sure you've followed all the steps. Hope that helps. Jobe - Thanks for the question. I don't think you want to relay the DHCP from your VPN provider to client of the access point: this would defeat the whole purpose of using NAT to allow you to share the connection between multiple devices. Most providers will allocate an IP address to the VPN interface on your side via DHCP when you make a connection; that's quite normal - mine does the same thing. It sounds like your problem is with the NAT setup, which bridges the gap between the access point and VPN interfaces. Take a look at my reply to James above and see if that helps at all. before the iface wlan1... in /etc/network/interfaces. Also, to avoid losing iptables after each reboot I followed instructions in https://wiki.debian.org/iptables and added /etc/network/if-pre-up.d/iptables. 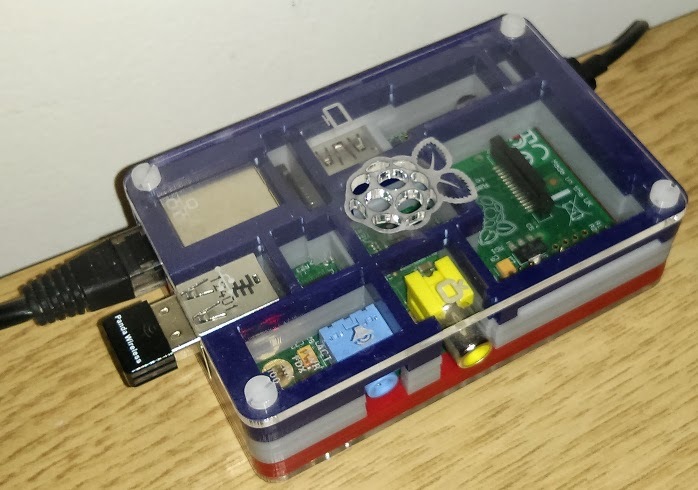 Peter - Your RPI is will be connected to your router's network and will also be hosting a second network of it's own using the wireless adapter - it will therefore be on two networks (three if you count the VPN, which runs over your router's network) and will act as a bridge between them. As such the IP address ranges for your router's network and the wireless network hosted by your RPI need to be different, but your RPI will have an IP address on the router's network as well as running it's own network. In short, this means that when you set the IP range in the /etc/udhcpd.conf file, you should make sure it's not the same as your router's, but should be a valid local IP address range (see http://en.wikipedia.org/wiki/Reserved_IP_addresses). My router uses 192.168.1.x, so I used the altenative local IP range 192.168.0.x . Roger - glad to hear you were successful, thanks for posting the tips. Hello, what do I have to change if I want to connect RPI to internet over WIFI to establish a VPN, and all clients over ethernet (switch connected to Rpi) should use the VPN. Is that possible? How? Could you post such a version? Doing it this way round you could ignore all the hostapd configuration, as you wouldn't need the RPI to act as a wireless access point. If your switch is a layer 3 switch with it's own DHCP server, then you could also skip the udhcpd configuration, as the switch will allocate IP addresses to the connected devices and your RPI will just act as a gateway to the VPN. If the switch is a layer 2 switch then you'd still need udhcpd, but you'd set the interface to eth0 instead of wlan0 in the configuration. I've never used OpenVPN over a wireless connection before, but I assume it's much the same as over a wired connection. You can almost certainly just use the same configuration as you would if your RPI was connected to your router using it's ethernet interface. The NAT configuration for the VPN tunnel should also be the same, but you will still need it in order to share the VPN connection between the multiple devices connected via the switch. Hope that all makes sense - let us know how you get on. Good guide, I haven't put it to use yet. I was wondering if it's possible for a device not to pass through the VPN. I plan on getting a USB-Ethernet thing for my little server I don't want it to pass through the VPN, would that be possible? It should tell you the service is running: if not you need to check the configuration for the VPN. You should see a short HTML file with the title "301 Moved". If the service is running and you can access the Internet from the RPI using curl above, then the VPN connection is working, but connections from your devices aren't being routed through the VPN. In this case check the iptables rules. It's also worth checking the setting you entered for the bind9 DNS proxy. I've got the same problem as Martin Willis. Denis - It looks like there's a problem with your OpenVPN configuration. [ ok ] Stopping virtual private network daemon: openvpn. [ ok ] Starting virtual private network daemon: openvpn. Press Ctrl-G to go the the end of the file and scroll up, keeping on eye out for lines that contain 'ovpn-openvpn'. There should be something in there that indicates what the problem might be. Starting domain name service...: bind9 failed! I was attempting several other tutorials so I may have guffed something up, but I'm not super savvy with DNS. It suggested in one place i looked that it apears as if the order that raspbian starts services at boot may have changed causing a chicken and egg problem with the dhcp server and the setting of the wlan0 fixed ip address. I don't know how to change the order services start at boot but my work around seems to do the job. I am actually using a different dhcp server and a different subnet than in this tutorial so posting details may just cause confusion but if what I have said helps even one then my job is done. Need your help here..I got the same problem as Denis where my openvpn doesn't show tun0 using ifconfig. I've look up /var/log/syslog and cant find any "ovpn/openvpn/ovpn-openvpn" in the log. btw, I'm using my own openvpn server that i've setup using my vps. For windows, I use this tutorial n runs perfectly w/o any problem. How do i troubleshoot this problem? Hingle - Check your bind9 configuration file /etc/bind/named.conf.options . You should have added a forwarders section to tell bind9 where to go for its DNS information. It looks like it's currently trying to connect to localhost. Nick - Thanks for the comment, that looks very useful. This will print a whole bunch of additional information to the terminal, and will hopefully give you some indication of what's wrong. decent - Also, check your openvpn configuration to make sure you're set up to use a tunnel connection, rather than a tap. If you're using a tap, you won't see the tun0 network interface, even when openvpn is running. I got a CA.crt and lots of .ovpn files from my VPN provider, one for each location. Do you have an idea how to set up the RasPi to easily switch between locations? Hi Thanks for the awesome tutorial. I was able to get the VPN to work. as rPi is hosting a second network, I am not able to discover devices connected to rPi from devices connected to Main router. Is it possible to have both the rPi and Mainrouter on same subnet? for example, my main router has ips 192.168.7.100 to 150, can I configure rPi to have address 192.168.7.20-192.168.7.30 instead of 192.168.0.X? When I type in this command curl --interface tun0 freegeoip.net/json/, after I started the OpenVPN daemon, nothing happens. And curl --interface eth0 freegeoip.net/json/ gives me an error: can't connect. It only works when I stop the daemon. [FAIL] Starting advanced IEEE 802.11 management: hostapd failed! I don't know what this means..
You'll need to restart the OpenVPN service each time you change to symlink to point to a different .ovpn file. rajesh - I've not tired this. I think technically it should be possible, but will probably involve setting up some additional routing rules in iptables. Essentially you'd be running two network interfaces (your wireless adapter and the ethernet port) with the same subnet. You would need to make sure that each one had a unique IP address within that subnet. Good luck! Mattia - Thanks for that, glad it worked out for you. If your openvpn service is running, it should default to the tun0 or equivalent connection. There should be an error message in the log that gives you a clue to what's wrong. first of all I'd like to thank you for this great tutorial. Everything worked for me untill I had to reboot my pi. Since that I'm not able to connect my smartphone to the accesspoint. My laptop can connect to the accesspoint but does not get an internet connection (DNS_probe_finished_no_internet). When I use 'curl freegeoip.net/json/' I get a positive reply for a working vpn connection. Furthermore 'sudo iptables-save' also delivery the right things. Any ideas how to my problem? Thanks for this tutorial. I bought a second hand raspberry PI and will try to make it work. I have 0 experience with linux though so might take me some effort. I am having some trouble finding a free vpn that supplies an openvpn configuration file you need to make this work. Any chance you could make this work with websites like this: http://bit.ly/1Jbxq2Z. I use these websites on windows and all I have to do is enable vpn and fill in login name and password and off I go. Maybe I can do this with the raspberry PI as well and just share the VPN connection I made? my devices are not able to obtain the ip address. Could you help me out with this ? I have a Raspberry pi VPN server (PPTP) in Spain and another Raspberry pi in germany this one will be the one I will convert into a "VPN Wireless Access Point". Is this possible with a pptp VPN? Now I have internet an can connect! Thanks again!! I have one safety issue, how can I block all internet connections not going true the vpn? If I turn openvpn of, it just connect over the regular ip. Will that be as well when the vpn is down for some reasons? I prefer no internet to an unsecured one! (1) By your method, what happens if the vpn connection breaks down e.g. because of a timeout. Does traffic than "leak2 through the normal connection or did you implement a mechanism that ensures that only traffic through the tunnel is happening? (2) what about DNS leakages or is this a server side issue from the VPN provider? Hey alphaloop, thanks for sharing this and all the wonderful help you have provided too all of the folks in the comments. I just got a second Rpi and a second router and I plan on going all mad scientist on my home network this weekend. I'm thinking of giving this whole VPN thing a try and I'm positive I'll be able to figure it out using your tutorial, your source material, and all the help you've supplied in the comments. Again, thank you for freely sharing your knowledge with those of us who are still learning. Sean - Sorry for the very slow response. Check to see of the tunnel interface (tun0) is shown when you run 'ifconfig'. Ryan - Whatever VPN service you use would need to support VPN client software that will run on Linux, and which exposes a virtual network interface you can route data to using iptables. OpenVPN is by far the simplest option for this. I used strongvpn.com for a long time and they were very good. Sahil - check the config in your /etc/udhcpd.conf file in the first instance. but it's possible this will also block traffic being output over the VPN. Sturmpilzchen - come to think of it, this isn't necessary: the NAT forwarding rules specify the tun0 interface, so if it's down no traffic will get routed. Peter - As per comment above, if the tun0 interface is down (i.e. the VPN is down), no packets should be forwarded from the wireless interface (wlan0). However, it's possible the processes on the Pi itself will still make internet connections over the eth0 interface in that situation. Regarding the DNS leakage, the DNS requests will be satisfied by the bind9 service on the Pi, which I set up to use Google's DNS servers in the instructions. I've checked that DNS requests from bind9 are made via the VPN connection when the VPN connection is running, but I've not checked that no DNS requests are ever made over the open eth0 connection, either when the VPN is down or otherwise. If this is something you want to ensure, you will want to look at adding some more iptables rules to block DNS over eth0. Unknown - You're welcome! Hope it went well. AP - Interesting idea! I'd be surprised if that wasn't possible. The simplest way would be to have two wifi adapters, but it might be possible to configure a single adapter to be both an access point and to connect to another wireless network. At any rate one of the (either physical or virtual) adapters would need to be configured to connect to the local non-secure wireless network. I think most of the instructions in the post should still apply if your internet connection is over a wireless connection rather than the ethernet port. It would be interesting to know if you're able to get this working. It works for me. Only thing to watch out, somehow the adapters switch the identifier (wlan0 / wlan1). Don't ask me why. I worked around this problem with using two whit the same driver:-/ But then it works fine for me. Samoht - If you can connect to the wireless network being broadcast by the Pi but can't access the Internet there are two likey causes: either the VPN connection isn't working or the iptables rules to route traffic from the wireless network to the VPN connection isn't set up correctly. You should see some output. But... if i have already my router which is doing the dhcp, should i also enable the dhcp on the pi? will it work? DeatK - Yes, you should enable DHCP on the Pi as well. Your router will be providing one local network, while the Pi will be providing a second local network that routes data via the VPN: you need DHCP to allocate IP addresses to devices on both networks. If you connect a device to the Pi's local network, it will be allocated an IP address by the Pi; if you connect a device to the router's local network, it will be allocated an IP address by the router. i am able to connect to the pi but now i get error that there is no internet connection!!! i am sure it was not empty before!!!! I have the solution to my problem and it was as simple as removing the hash from "#allow-hotplug wlan0" in etc/network/interfaces to leave "allow-hotplug wlan0"
so the dhcp is not working properly? and i have found the solution, i had to disable from the reboot the dhcpcd service. Hi, thanks for the tutorial. Is it possible to get the VPN provided DNS servers before the Google ones? I am impressed with these details. I also need to purchase a reliable VPN service for my android phone but not able to find a good service. But I am now thinking to make list of best vpn service and software and use their trial versions before buying. Really very interesting and very valuable information about the vpn nice work. Very informative article regarding VPN I have been using best vpn service provider for encrypting my data. Such a nice blog and I appreciate your all efforts about your thoughts. It’s really good work. well done. Please keep sharing more about Software Defined Network. Thanks For This Informative Article. It Helps All Those People Who Are Confused In Selecting Hosting Like me. Module Transceivers Are External To The Network And Are Installed And Function Similarly To Other Computer.